Citizen Cain’s second album saw their song-writing and musical style develop and mature while still retaining their trademark sound. Comparisons were once again made with classic prog acts, especially early Genesis. This was due to the heavy similarity between front man Cyrus’ vocal style to that of Peter Gabriel and the overall sound of the material which again drew heavily from the band member’s influences. A new guitarist, bass player and drummer helped shape this new style and critics welcomed this change in musical direction with bands such as Gentle Giant and Jethro tull now being referred to as inspiration. 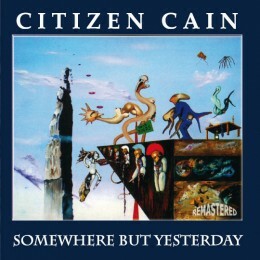 Originally released by SI Music in 1994, re-released by Cyclops Records in ’95 and now remastered and re-issued by F2Music this second offering from Citizen Cain remains the favourite for many fans, who often refer to it as the album Genesis would have written after “Lamb Lies Down” if Gabriel hadn’t left.